There is no tasting review of Salignac Napoleon Cognac yet. The house of Salignac Cognac has a history dating back to 1763, when it came into being thanks to a country gentleman, Antoine de Salignac. Because of this wonderfully long history, it’s possible to still find some very old, very rare cognacs from the house of Salignac Cognac. These, naturally, are high priced and highly desirable cognacs, easily reaching four figure sums. Today, the brand of Cognac Salignac is owned by one of the biggest cognac houses – Cognac Courvoisier – who in turn is owned by Beam Global. The cognacs produced under the Cognac Salignac label today are generally very young – VS grades of around 2,5 to 3 years of age. During the global downturn, many cognac drinkers turned to cheaper options whilst still wanting to enjoy their brandy, and the brand of Cognac Salignac proved a shrewd purchase for Courvoisier during this period. Indeed, in 2009, when cognac shipments dropped by 12.4 per cent, Cognac Salignac sales were over 100,000 cases – a massive 8 per cent of the whole of Courvoisier’s sales that year. Today, Cognac Salignac is popular in many countries throughout the world, including the USA. Being a younger brand, many like to drink it with a mixer, or use as a cognac element in cocktails. However, many people also enjoy drinking it neat or on the rocks. 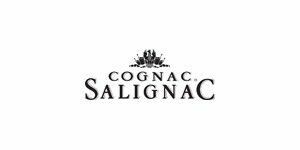 Currently the production of Salignac VS Cognac is the only new bottles that are produced. This is a blend of Fine Champagne cognacs and sells for around €16 euros per bottle. It is possible to find rare examples of old Salignac Cognac, from the days when it was run as an independent enterprise. One such example is the Salignac 1865 Cognac, which, if available, commands a price in the region of €2,750 euros. There is no information available about visiting Salignac Cognac. so i actually have an old bottle of Salignac Cognac. It says it was 50 years old when it was bottled and it has been sitting around my grandparents house for 30-40 years now. I was wondering if anyone could help me find out if it is worth any money. L. de Salignac Reserve O.P. Cognac I have just acquired this exact bottle in perfect unopened condition. The drink level is down to the top of wax mark on the neck. Just wondering if any one knows how old it is? Value? I found out about Salignac about three years ago and I love it. It is now my preferred cognac. Best one on the market for the price. When i drink cognac, i drink Salignac.